PD Active is a non-profit created by and for people with Parkinson's Disease (PD) their families, caregivers and friends. We believe we are our own best advocates, and that acting on our own behalf fosters independence, dignity and respect while preventing depression and isolation. Together we develop and administer programs that bring exercise, fellowship, support, movement and laughter to the East Bay PD community. We offer a model of self-management, utilizing medical teams, volunteers with PD, caregivers, family and friends to help us continue to live independent, productive lives. Yoga for PD began as a pilot program in October 2008 with 12 students. A grant from Yoga Dana Foundation enabled us to continue in 2009, expanding to 20 students with an active waiting list. Successive Yoga Dana grants helped us expand to two classes a week, serving more than 30 students. This year, with help of our fifth Yoga Dana grant, we are pleased to offer two classes a week, one in Oakland (@ Piedmont Yoga) and one in Berkeley (@ The Yoga Room), to about 40 students in all. We continue to maintain an active wait list (class size is limited not just by space, but by the number of assistants needed to support safe practice). People with PD need to keep moving, and yoga brings both purposeful movement and mindfulness. We learn to look inward, quieting our mind and body, and to be active, stretching and bending, moving with confidence. Students practice asanas in a safe, comfortable environment with assistance and modifications available as needed. Our instructor, Vickie Russell Bell, has more than five years of experience working with the PD community. She has developed a deep understanding of the challenges of PD and has adjusted her curriculum to meet these specific challenges, which include encouraging fluid movement, flexibility, strength and balance. Breathing, meditation and restorative poses also help alleviate the depression, anxiety and pain that accompany PD. Vickie is supported by a group of wonderful volunteer assistants who support her in the yoga studio. Vickie Russell Bell continues to train prospective teachers and assistants. 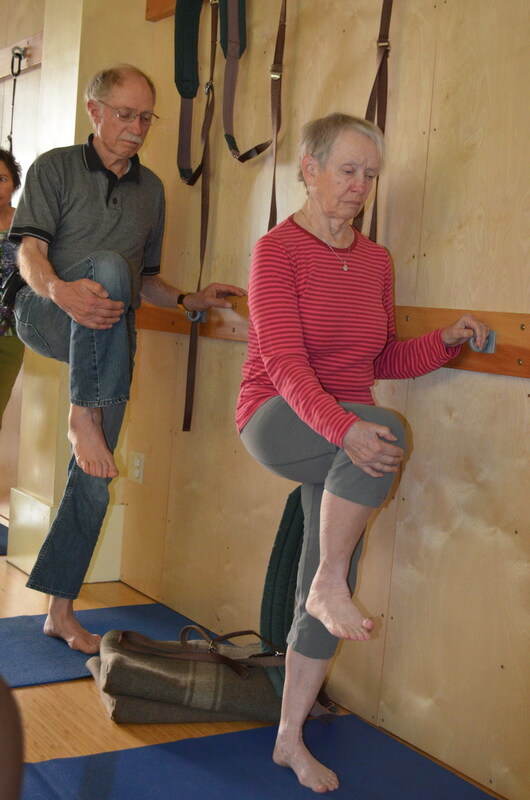 "Yoga for People With Parkinson's," a new class at Adeline Yoga Studio, was developed and is taught by our first two graduates, Barbara Phillips and Suzanne Drolet. The teacher-training program averages ten to twelve students in-progress. We are also working on instructions for beginning a safe, home practice for people with PD, and a wall-supported Salute to the Sun reminder card. We are grateful to Yoga Dana for supporting our journey of healing as we practice the asanas that bring us energy, confidence and peace. PD Active has been a grant recipient of Yoga Dana Foundation since 2009.